Simplify healthy meal planning by filling half your plate with veggies. That’s an easy way to know you’ll get the recommended amount of vegetables each day without worrying about the math. How many baby carrots are in a cup? How much broccoli equals a serving? Confused and overwhelmed by keeping track of cups or serving sizes? Photos: What Is a Serving of Vegetables? Even the most well-versed nutrition professionals don’t have all the measurements memorized. Eating healthier would be easier if there were a simple image of what veggie-rich eating looks like. There is! 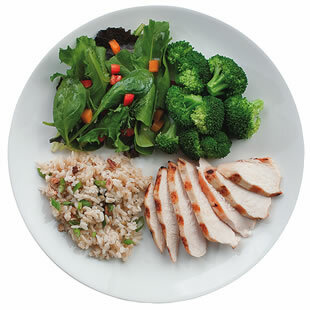 Simplify by filling half your plate with vegetables at each meal. Imagine a dinner plate and divide it in half. Fill one half with vegetables and divide the other half into two quarters. Fill one quarter with lean protein, such as fish, skinless poultry, lean beef, beans or tofu. Fill the other quarter with a grain-based or starchy side dish, preferably a whole grain like brown rice, whole-wheat pasta or a slice of whole-grain bread. What this method lacks in precision it more than makes up for in good sense. If you focus on making most of your meals look this way, you’ll automatically be following sound nutrition guidelines and choosing appropriate portions—without having to pull out a nutrition guide or a measuring cup every time. Now that you’ve got that down, focus on including lots of color and variety when it comes to your vegetables. This dish of roasted broccoli and tomatoes is tossed with bright Mediterranean ingredients just before serving.